Our copy of Big Badaboom was kindly supplied by Gigantoskop. Thanks a lot you crazy people. This is the day, people. This is the day when we’ll make it on the watch list of every intelligence agency on this planet because we’ll be talking about building bombs. The High Supreme Goblin Necromancer is upset about bomb-building in general because everyone else is doing it. The Gnomes? Building Bombs? The Dwarves? Obviously building bombs. Even the bloody, happy, gold-burying Leprechauns are building bombs. Only the Goblins are not building bombs. His High Surpemeness is understandably ticked off by this gap in their arsenal. He wants bombs. The obvious move would be to hire an engineer from the other races – there’s always one willing to take the money – and teach his Goblins how to build bombs. But his High Supremeness doesn’t like to spend money. Or he could find some books on the subject, but teaching his Goblins to read first would take a while, and he is impatient. And so he does what any sensible necromancer with an infinite supply of reanimated Goblins would do: he locks a bunch of them into a heavily guarded dungeon and tosses live bombs in their for them to tinker with. Goblins who stupidly blow themselves up are resurrected to have another go, survivors are rewarded. It’s a hare-brained scheme to learn bomb-building, sure. But the High Supreme Necromancer is still a Goblin, and they are not exactly famous for their planning abilities. And so you find yourselves in a small dungeon room, tinkering with a dangerous explosive device without any prior experience, tools, or hope to survive. 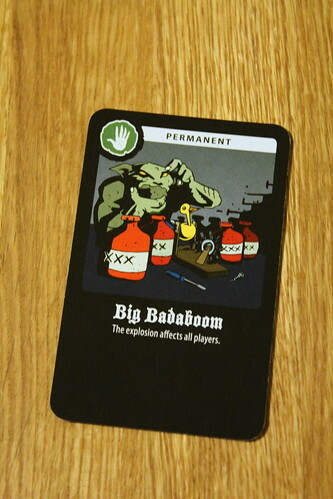 Big Badaboom is a pure card game, and so the bomb obviously is nothing but a set of cards as well: one Bomb Card that may have special rules for this round plus a number of Mechanism Cards, devices that keep the bomb from exploding. Take all the Mechanisms out and BOOM! The Mechanism cards have different names, pictures and extensive text on them, but that’s all flavour, the only important thing about them is whether they are in the bomb or not. All Goblins also start with some hand cards. Most of these are green Trick Cards, but mixed in are red Gadget Cards as well – they come from the same card pile, but they have different backs, so the other players can always tell what you are holding. The bomb starts with a random Goblin and it’s technically his turn. But everyone is active at all times and it’s usually way more fun to play cards on someone else’s turn. On “your” turn, after you draw a card, all players are allowed to play Trick Cards from their hand. They could be communal-minded and support you in your difficult task – but nooo, the other players are also Goblins, very little they do will help you gain points. About half of the Trick Cards force you to end your turn right there and pass the bomb to the next player, who starts a new turn of his own. Others protect the fortunate player they are played on – i.e. not you – from the inevitable explosion or do other fun things like reversing the direction the bomb is passed in. In our first two games, this phase took forever, so we introduced the house rule that the bomb holder does a quick countdown from three, any cards that are not played then remain unplayed. Like I said, Goblins are long-term planing impaired, drawing this phase out is not only inappropriate for the game, it’s downright boring. If, by some sort of divine intervention or because everyone has run out of cards, you are still holding the bomb after the trick phase, you get to tinker with it. Isn’t that exciting, little Goblin? You get to play with a bomb that is lightyears beyond your understanding. There is no way this could be bad for your career. Well, here’s some good news for you: as long as there is at least one Mechanism remaining in the bomb, it’s completely safe. 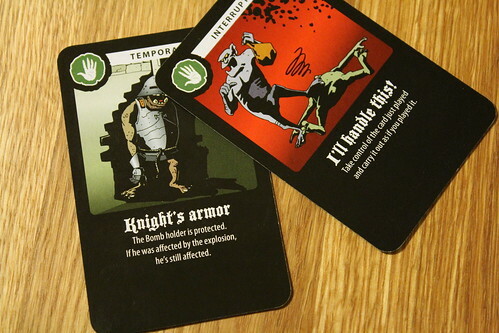 You are welcome to tinker with it by exchanging any card in the bomb against one of your hand cards. So how about we take out, oh, I don’t know, this funny-looking moving thing there. A second piece of good news for you: when you remove a Mechanism from the bomb, it becomes armed, but it won’t explode before the start of the next turn. Green hand cards that you put into the bomb don’t do anything in there, they just keep the bomb-casing nice and heavy. But other players may take these cards out again and use them. Red cards are way more interesting. These so-called Gadgets change what happens when the bomb explodes in new and interesting ways. It might suddenly kill the bomb-holder and the player to his right when it explodes. Or, even better, only the player to the right. Or simply everyone around the table. This is a bomb, people. These things are not very selective. No matter what you do, at some point the worst will happen and the bomb explodes. 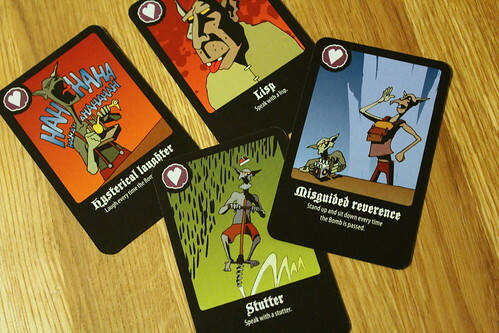 Now you have to figure out who is affected by the explosion – these Goblins will die and, much worse, not get any money. Except, of course if they have some kind of protection to save their life. Card effects are a bit unclear here, saying things like “you are protected but you are still affected” and “that player becomes affected, you become protected”. When you have one of them it’s not so bad, but what when you are already protected and another card says you become affected? After a heated discussion, we decided it’s more in the spirit of the game that, once you are protected, you stay protected, no matter what affects you. After all, why would your armor suddenly not protect you any more? But the rules could be clearer about this and about other things as well, some interpretation was required. Once you figured out who does or doesn’t die, it’s PAYDAY! The day every Goblin loves most. All survivors get a one coin Survival Pay, his High Supremeness must assume you learned something. If you were the bomb holder and survived, that’s an extra coin for you right there. Every Mechanism in your hand at this time is worth another coin, you got some valuable knowledge in your hands, Goblin. Finally, some of the Trick Cards have secret missions on them that, if fulfilled, you may now discard in exchange for more coins – secret missions like “be the only survivor” or “make sure everyone survives”. Why would the High Supreme Necromancer suddenly reward you for such things? Who knows, being a Goblin he probably wasn’t all that stable to start with, and necromancy is known to damage your sanity as well. So lets go with “he surely has his reasons”. That’s the survivors dealt with, but what happens to the explosively deceased? Well, your boss is a necromancer, it would be such a waste to leave your rotting corpse lying around instead of sending you back to work. But he is also a Goblin, so he’s not naturally competent at anything, especially not necromancy (or, of course, bomb-building). When he brings you back there may be … side-effects. And those answer nicely what kind of game we’re dealing with here. A silly kid’s card game? A deep strategy game gone horribly wrong? 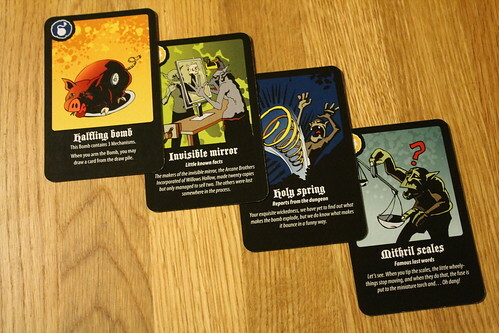 Wrong and wrong again, Big Badaboom is a small-group party game and the Resurrection Cards drive that point home. You may come back with a lisp, or a really bad mature language problem. You might end up loudly confessing your affections for all your fellow Goblins or insisting that, without any doubt, you are absolutely, positively, not the Pope of Finland. It’s silly, but it’s bloody hilarious at the same time. According to the rules, these cards are optional, but they really made the game for us, so I strictly recommend you treat them as mandatory. Going even further, the rules say to discard your Resurrection Card after the next round, but we couldn’t find any good reason for that. Keep those cards, add another one every time you die. By the time someone has the ten coins required to win the game, he’ll be squeaking “I’m not the b****y Pope of *****g Finland, honey, I really am not, hahahahahaha, NOOOOOOOOOO, d*** it all to f***, you beautiful, beautiful goblin.” And if you don’t think that’s hilarious, then stay away from Big Badaboom, because this is what it is. As if you couldn’t have guessed by the package – this game comes packed in a plastic bomb, that’s a big clue right there – Big Badaboom is not the next Puerto Rico. It’s a game with very little strategy that loses most of its appeal when people think to much about what they are doing. You’re Goblins, act like it. It is, however, a really great time when you give it a chance, have at least four players but five are preferred, and enjoy being silly to the point of being ridiculous as much as we do. As a final warning, be advised that yelling obscenities with a squeaky voice from round two on will leave you with a sore throat the next morning. Building bombs is hazardous to your health!